East Timor ranks as one of the poorest countries in the world with a GDP of US$366 per capita. One in five people live below the international poverty line of a dollar-a-day and there is considerable inequality in levels of poverty, especially between urban and rural areas. Less than 40% of the national demand for the staple crops of maize and rice is produced locally. One crop per season is the norm due to malfunctioning or damaged irrigation infrastructure. Half of the children under five years of age are stunted. The most frequently reported water-borne and related diseases; skin diseases (over 40%) and diarrhea (around 25%). Reliable irrigation systems reduce the risks of food production failure in the rural areas. An improvement of rural roads facilitates the exchange of goods between markets and remote communities. Improved water supply and sanitation reduces water borne and transmitted diseases. The stabilizing effects of infrastructure systems on the economic and social setting of the rural population depends on its long-term functionality. Community-based building and maintenance requires pro-active people within the communities, and support to develop their organizational and leadership roles. The ‘Programme to Stabilize Food Security and Promote Peace in Rural Areas of Timor Leste’ (FSP) has operated in four out of 14 districts from January 2003. The project aimed to strengthen the capacity of communities and their leaders in the planning and managing small-scale development activities, thus complementing government initiatives in decentralization, poverty reduction and peace-building. The overall objective was: ‘Rural people’s capability for peaceful social interaction and economic development necessary to ensure food security is improved’. at least 75% of the identified infrastructure projects were implemented. A direct social benefit was expected in that village councils and the population in 50% of the 60 supported communities would use peaceful and constructive ways to settle conflicts of interests. Frequent joint meetings with the local government, village councils, potential work group leaders, community members and FSP technicians helped in clarifying the roles and responsibilities of each stakeholder prior to the physical implementation of the infrastructure project. Increased understanding of the specific roles and functions between council members, work group leaders and village heads was enhanced by FSP technicians who provided coaching in management and organizational matters throughout the whole process from project selection to completion. Council members and village heads responded positively to training in leadership skills, while the work group leaders responded better to technical subjects. Compared with stand-alone theoretical training, the ongoing on-the-job coaching and assistance allowed village councils and work group leaders to better grasp the practical implications of the theoretical subjects. An important initial event to strengthen and confidence was the “public signing of project implementation agreements” between the village council, FSP technicians and the village chiefs. The council members were able to officially announce their agreed roles and responsibilities. Moreover, the villagers acknowledged the new organizational structures. Considering the signing ceremony as the starting point for physical implementation, people became confident that they would get the physical facilities they were waiting for. This motivated them to join in the work. The generally smooth progress of the implementation then helped to consolidate and affirm the implementing parties’ confidence in their own abilities. During the preparation phase, the continual explanations on how an infrastructure is constructed and maintained, was essential to achieving transparency. It also helped to broaden the communities’ understanding of the importance of the various steps during the planning, implementation and maintenance. Publicly announcing the “technical standards to be applied and the organizational structure” provided opportunities to the whole village, and to individuals that felt affected by the intended infrastructure works, to discuss the issues directly with the respective council member in charge. These events also enabled all stakeholders to identify potential problems with the projects, and suggest and discuss possible solutions. During the preparation phase, council members and the communities jointly identified local resources, which would contribute to project implementation. Also discussed were the monetary values of contributions by the community, such as local materials and labor days, and locally non-available materials contributed by the FSP. On average, the contribution by communities exceeded 10% of the total monetary value of the rehabilitation. uring the first weeks of implementation, skilled FSP technicians provided intensive coaching to the overseeing council members and work group leaders. Once the responsible persons became familiar with organizing the daily work, the FSP technicians gradually reduced their own involvement. As the council members took upmore of responsibilities for organising worker groups, the collection of local materials, checking progress and quality. The FSP technicians’ role then switched to regularly observing the overall managerial and technical processes and advising the communities on related matters required. The aim of introducing conflict analysis and communication skills to village councils and work group leaders was to develop their understanding of potential threats and provide them with the skills to identify possible solutions. Weak anticipation of potential problems was one root cause of the wide spread hesitancy among the rural population to take on responsibilities for actions, as their fear of failure lead to a lack of responsiveness. Therefore, the practical handling of conflict analysis in real day-to-day cases, identifying the underlying factors and testing possible solutions became a valuable learning experience for all concerned. Experience gained by the FSP project showed that this type of approach requires a minimum of three years’ commitment by donors and implemen-ting agencies. Strengthening people’s capabilities involves time-consuming learning processes; the ongoing coordination of procedures in relation to the proposed infrastructure; and the recognition that rural people can only join in communal works during the agricultural off-season. Further from the technical viewpoint, physical implementation can be undertaken only during the dry season. History has left an unfortunate legacy in parts of the rural population. Many communities who have been resettled (either forcibly or otherwise) during the Indonesian occupation to various locations near main roads. These received special attention from the occupier in order to “win their hearts and minds”. As a result, a dependency attitude developed and is still evident among many of these communities. It was not always possible to motivate the village councils to become involved in activities, which were designed to enhance their roles, responsibilities and social capacities. Many of them simply wanted the infrastructure scheme to be completed, and saw their role as solely ordering the people to do the work. Community members often did not respond to such ideas or orders from their leaders and remained inactive. does not agree to capacity building support? The lesson from FSP was to make progress and to defer further assistance to that community and to work with other communities where the leadership is more amenable and progressive. If the necessity for the infrastructure becomes so great, or the leadership becomes convinced by observing the successes of other villages, then the chiefs might, at some later time, seek to again engage with the project. This would involve a new starting point for the engagement through which the stakeholders might agree to the precondition of social capacity building efforts. This situation exists in some communities that were led by strict, authoritarian leaders. In fact, the Timorese tend to classify villages as being good or difficult. The perceived quality of the village population is associated with the village chief’s attitude: if he is a ‘good’ and responsive leader, then it is easy to interact with the villagers. If the chief has an image of being ‘difficult’, then it takes a considerable effort to get the people’s involvement. Village chiefs have dual roles: The community sees them from a traditional viewpoint and requires them to lead and often take care of their daily matters. Additionally the chief is also now an official part of the government structure, and is expected to attend official functions. Further due to the still somewhat feudalistic system, the chief is the one and only entry point to the community for the departments of government services, as well as for other development organizations. Therefore, chiefs are often preoccupied with attending other administrative and technical trainings, governmental and church meetings, to which they are invited or required to attend. The situation has begun to improve slowly with the establishment of the village councils, which were only incorporated into the local governance system in 2005. Having council members available, in theory enables the chiefs to either share or delegate responsibilities. However, due to the still limited capability and understanding of respective roles, it will take some time until sharing of responsibilities is a habit of professional acting. Being aware of the many functions of village chiefs from the outset, FSP directly took up the challenge to involve this new structure of village councils into organizing the project’s infrastructure rehabilitation works. Thereby, it assisted the councils and chiefs in learning and experiencing their roles through practical activities and training. The villagers were unable to manage the rehabilitation on their own. With representatives from the sub-district and district administrations, and with NGOs in order to avoid duplication, and to reduce potential conflicts between communities and third parties caused by uninformed or duplicated effort. What factors might constrain smooth implementation, and how to overcome them. The village chiefs took the role of observers and general advisors. The roles and responsibilities that village council members, community leaders, and the workers would take during implementation. how to compensate families whose land would be affected by the infrastructure scheme. In case the community could not agree on these essential principles, even after repeated meetings, then it was doubtful to what extent they will take up ownership of the infrastructure; and also whether a completed infrastructure scheme would be effectively maintained. A useful indicator of the community’s enthusiasm for the project was their attendance at these public meetings: The higher their active participation, the more likely their readiness to become the owners of the infrastructure and its maintenance. A technical survey aimed at identifying the proper locations for the proposed infrastructure schemes, there technical requirements, anticipated time frame for completion and cost estimates were prepared. The responsibility for the technical survey was with the FSP technicians. They were supported by the village council members and identified work group leaders in carrying out the survey. At the same time they trained them in identifying potential technical problems that might come up during construction. Involving these people helped to ensure that the entire community better understood why all these activities were necessary. During the survey, the council members’ and work group leader’s skills needs were assessed for possible improvement, and became the basis for tailor-made capacity building inputs. Previously unexpected problems, e.g. when privately owned land was affected by the scheme, were identified and potential solutions proposed, resulting in either compensation to the owner or minor changes in the design. The clear interpretation and explanation of the survey results as to why a certain location was selected as the most appropriate was of utmost importance to reduce problems. Many people in the community tended to propose a wealth of alternative locations. Since most of these locations were not feasible from a technical point of view, rejection without clear reasons would have caused dissatisfaction of those whose suggestion was not taken up. In turn, they might have tried to negatively interfere in the implementation process. The well documented survey results became an integral part of the implementation agreement between the community representatives and FSP technicians. Proposal application: The village councils were trained in how to formally request technical assistance from the FSP. Thereby, the council members acknowledged their mandate to represent the community, and their readiness to take responsibility for its organization and management. This document also helped them to keep track on costs and contributions. Group formation: Community members were formed into work groups. These groups were assigned to parts of a schemes’ construction. For example, for road construction, the work groups took up the measurement of certain distances. For irrigation schemes, groups were assigned to measure certain distances or to identify the locations of channels. Identification of the parts of the infrastructure schemes requiring rehabilitation. Identification of risks, potential conflict factors, and ways to pro actively address them. Public signing of the join implementation agreement: After successful completion of above steps, the official signing of the agreement between village councils as the community’s representatives and the FSP technicians took place. The agreements served as guidelines for all on the implementation steps, contributions, standards, time frame, functions and responsibilities. A public announcement of all details during a third community meeting helped to inform the villagers, enhance clarity and to reduce potential conflicts due to misinformation. Financial disbursement: Through a process of progress-oriented disbursement for buying locally non-available materials, the managing council members learned about the advantages of proper budget management; for example, simple tendering procedures, quality control and timely and needs-oriented delivery. Weather conditions / seasonality: Most of construction work was done only during the dry season. Furthermore, rural people were usually only able to join communal works only during the agricultural lean season (between planting and harvesting season, and between post harvest and pre-planting season). Work speed: Physical implementation was sometimes delayed due to the workers slow rate of work. FSP technicians had to align their expectations with the communities’ capacity to deliver by re-scheduling or re-planning technical details. Availability of materials: the timely delivery of materials in batches is essential to prevent loss of materials due to theft or deterioration in quality (i.e. cement). This was avoided through weekly deliveries, because storage facilities were non-existent in the villages. Upon completion of the physical implementation, the village councils were advised to seek formal recognition of the technical standards achieved. This was usually undertaken and issued by for example public works departments, irrigation departments or, in the case of clean water, by water and sanitation services. The community’s effort thereby received formal recognition, and the village councils learned about the services that the respective departments could offer in case of future maintenance needs. Of 25 schemes that were implemented without attention to social capacity issues: less than 60% were constructed to the required technical standards. Of the 7 schemes that were implemented with consideration to social capacity issues: only one out of the seven was not completed to the required technical standard. Better access to markets through improved rural roads: Communities rehabilitated and expanded a total of 30 km of feeder roads in five locations. With improved access between the villages and local market places, the frequency of vehicle traffic increased from an average of one trip per month to 14 trips per month during the dry season. More production through functioning irrigation systems: By rehabilitating small-scale irrigation schemes, communities were able to increase the area of arable irrigated fields by 77%, from 1,444 to 2,561 hectares across 18 locations. By having more productive land available, more households became actively involved in rice cultivation. 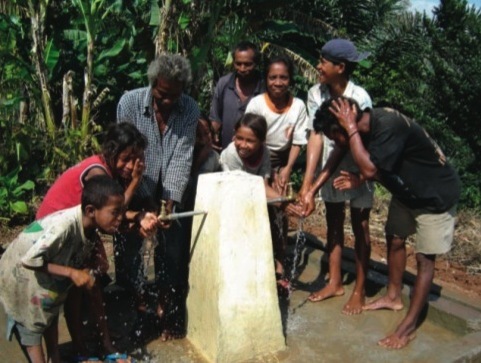 Better access to clean drinking water: Nine communities became active in improving clean water systems. The construction of 5 piped water systems and 12 hand dug wells benefited 660 households, or 90% of the community population, through closer access to clean water. This has greatly reduced the time and labor demands on women and children in fetching water.